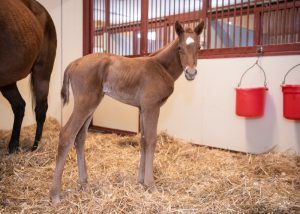 A Shin Forward was represented by his first American-born foal on March 5, when Miney’s Awesome (Awesome Again – Mine Tonight by Upper Nile) produced a filly. Miney’s Awesome is the dam of six winners of seven to race, and is a half-sister to three stakes horses. The filly was bred by Vivien Malloy’s Edition Farm. A Shin Forward (Forest Wildcat – Wake Up Kiss by Cure the Blues), who raced in Japan, was also bred by Mrs. Malloy. The defining victory of A Shin Forward’s racing career came in the 2010 Group 1 Japan Autumn International Mile Championship. The same year he also won the Group 3 Hankyu Hai. 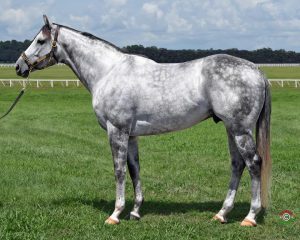 Over five campaigns, A Shin Forward won three stakes and placed in five more, and retired with $3,416,216 in earnings. He is the third all-time leading New York-bred earner and the state’s all-time leading earner on the turf. A Shin Forward, who already has five crops of racing age in Japan, is owned in partnership by Edition Farm and Lady Sheila Stable, LLC. Sequel Stallions New York announced Wednesday that the first four mares bred to Destin (Giant’s Causeway) are confirmed in foal. “We are so excited about the popularity of Destin in his first year and couldn’t be happier that he is proficient in his new job. He has great libido and is getting the job done on some very nice mares,” said Sequel’s Becky Thomas. A full brother to Grade 1 stakes winning sire Creative Cause, Destin set a new track record in the Grade 2, 1 1/16-mile Tampa Bay Derby winning by a length in 1:42 4/5. Three months later he was defeated a nose by Creator in the Grade 1 Belmont Stakes. Destin retired with 5 wins, 2 seconds and 2 thirds in 15 starts with earnings of $947,800. Five-year-old Destin is out of millionaire Dream Of Summer who won the 2005 Grade 1 Apple Blossom at Oaklawn Park. She is a multiple graded-stakes winning, graded-stakes producer with over $2.3 million in progeny earnings. Destin is also full brother to graded stakes winning filly Vexatious, as well as half-brother to black type placed producer, Taboo. Destin stands at Sequel New York for Gainesway Farm, Eclipse Thoroughbred Partners, Twin Creeks Farm and Sequel New York for a fee of $6,500 LFSN. Due to the week’s inclement weather and ground conditions on the farm, Questroyal North will be postponing our Stallion Open House, originally scheduled for Sunday, January 27th. We are tentatively rescheduling to Saturday, February 9th from 10am-3pm, and will confirm that date as soon as possible. We sincerely apologize for any inconvenience, but the welfare and safety of our horses and guests is our primary concern. As always, our stallions are available for viewing 7 days a week by appointment. For further information or to schedule an appointment, please call Kelly McCombs at (518) 541-3280 or Bill Allen at (518) 965-9346. Due to the snow forecast, Irish Hill and Dutchess Views Stallion will reschedule its stallion show originally set for January 19. The Irish Hill & Dutchess Views Stallions stallion show will now be held on Sunday, January, 27th from 11am to 3pm. All other details remain the same (full lunch, season raffle, etc). Questroyal North in Stillwater, NY has rescheduled its Stallion Open House that was previously scheduled for this coming Saturday, January 19th, due to the impending winter storm. The show has been rescheduled to Sunday, January 27th from 10:00 a.m. – 3:00 p.m. Light refreshments will be served. The stallions will be still available for viewing by appointment only on Saturday, January 19th. Please call Bill Allen to schedule a time at 518-965-9346. Rockridge Stud in Hudson, NY has decided to reschedule its annual stallion show and open house that was previously scheduled for this coming Sunday, January 20 due to the impending winter storm. The show has been rescheduled to Saturday, January 26 from 11:00 a.m. – 2:00 p.m. Full lunch buffet will be served and drawings for free seasons to each of the stallions will be made at the show. The stallions will be still available for inspection by appointment only on Sunday, January 20. Call 518 851 6616 to schedule an appointment. Barry Ostrager has announced that multiple graded stakes-winning millionaire Camelot Kitten will join the 2019 stallion roster at his Questroyal North in Stillwater, where he will become the first son of perennial leading sire Kitten’s Joy to stand in the Empire State. The 6-year-old Camelot Kitten is owned by his breeders Kenneth L. and Sarah K. Ramsey and will stand as their property for $5,000, live foal. The Ramseys have been in the top 10 on the North American leading owners’ list every year since 2009, and topped the list three times. Camelot Kitten won six races, five of them stakes, and finished second three times, including two graded stakes, while earning $1,068,977. He broke his maiden at Belmont Park in his 2-year-old debut, and his first stakes victory came at age three in the Grade 2 American Turf Stakes at Churchill Downs. Four weeks later, he captured the Grade 3 Pennine Ridge Stakes at Belmont, followed by a score in the Grade 2 National Museum of Racing Hall of Fame Stakes at Saratoga. He then won the Grade 3 Hill Prince Stakes at Belmont, capping a sophomore season in which his exceptional stretch prowess accounted for four graded stakes. Camelot Kitten has four full brothers, all winners, out of the Forestry mare Celestial Woods, including multiple graded stakes-winner Bobby’s Kitten. Now eight, he won the Breeders’ Cup Turf Sprint and was third in the Breeders’ Cup Juvenile Turf, earning $1,389,417. He stands in England for 12,500 euros and his first foals are yearlings of 2019. He is a shuttle stallion and is the first son of Kitten’s Joy to stand in Australia. Three other sons of Kitten’s Joy will be standing for the first time in 2019. Roaring Lion has joined the stallion ranks for Qatar Racing at Tweenhills Stud. He’s a four-time Group I winner with earnings of $3.57 million. Oscar Performance, a 7-time graded stakes-winner who earned $2.34 million, will stand at Mill Ridge Farm in Lexington for $20,000, and Hawkbill, Champion 3-year-old in England and 6-time Group winner, will stand at Dalham Stud in Newmarket for 7,500 euros. Kitten’s Joy was the leading sire in North America in 2018, the second time he has reached the top spot in the last six years. He was in the top five in the other four seasons, finishing third in 2014 and 2015, fifth in 2016, and third in 2017. In the season that just concluded, Kitten’s Joy set a personal record of more than $18.6 million in progeny earnings. He has reached nearly $97 million in career earnings, has been the No. 1 turf sire for the last six years, and is the No. 1 sire by average number of stakes-winners per year (19) for five. His runners have won nearly 2,100 races and averaged more than $100,000 per starter. He wound up 2018 in second place on the general sire list with 177 winners, just three behind the leader, and was No. 1 with 80 repeat winners. He’s just nine away from 100 black-type winners and has 174 registered 2-year-olds. Kitten’s Joy stands in Kentucky for $75,000 live foal. For more information and booking to Camelot Kitten, please contact: Kelly McCombs, Office Manager (518) 541-3280, questroyalnorth@gmail.com or, Bill Allen, Farm Manager (518) 965-9346, allenbill99@gmail.com. Sequel Stallions has announced that first foal for multiple stakes winner and graded stakes-placed runner Union Jackson is a colt. 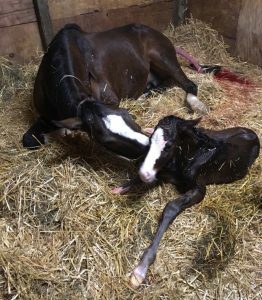 Bred by the Mr. Amore Stables of Ron Lombardi, Union Jackson’s first foal, a flashy bay out of the Rockport Harbor mare Hoboken Honey, was born at Sequel New York on January 13. Mr. Amore Stables, a multiple graded stakes-winning earner of more than $10 million, has enjoyed much success lately having campaigned, among others, Grade 1 Champagne winner Firenze Fire as well as Grade 1 Breeders’ Cup Turf Sprint runner-up Tightend Touchdown. Hoboken Honey is out of a half-sister to Daiwa Bandit, a multiple stakes winner in Japan of over $1.4 million. She is from the immediate family of Grade 3 stakes winners Advancing Star ($794,470, stakes producer) and Darby Fair ($337,374, sire). A son of two-time Horse Of The Year and champion sire Curlin, out of Grade 1 stakes winner Hot Dixie Chick, half-sister to Grade 1 Kentucky Derby Winner Always Dreaming, Union Jackson was bred in Kentucky by Barbara Banke’s Grace Thoroughbred Holdings, campaigned by her Stonestreet Stables, and trained by Steve Asmussen. Union Jackson broke his maiden by 7 3/4 lengths going six furlongs at Keeneland becoming a “TDN Rising Star.” He went on to win an 8 1/4-length score in the Sam Houston Sprint Cup Stakes and a victory in the Iowa Sprint Handicap, which he took while running six furlongs in 1:08.75. On the board in 9 of 11 starts, he won 6 races by over a combined 27 lengths with earnings of $273,000. 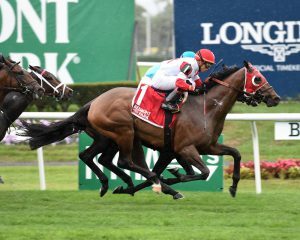 The mare, Hoboken Honey, is breeding back to Union Jackson in 2019. McMahon of Saratoga Thoroughbreds has released its 2019 stud fees and added details about the farm’s January 19 Open House. Standing at McMahon for $7,500 live foal is New York’s leading 2-year-old sire of 2018 Central Banker. Progeny of the graded stakes-winning son of champion Speightstown surpassed $1 million in earnings last year, the highest for a New York Sire since City Zip in 2005. His top earner Bankit ($329,625) won the $250,000 Sleepy Hollow S. at Belmont by 5 3/4 lengths, finished second in $200,000 Funny Cide S. and was second by a head in the $400,000 Remington Springboard Mile S. Bankit is the leading money-winning colt by a first crop stallion in 2018. Champion sire Teuflesberg is a top-five New York Sire by lifetime average earnings at $60,540 and will stand for $5,000. New York’s leading second crop sire and top ten sire of 2-year-olds in 2018 Forty Tales will stand for $3,000. Joining several other farms in the Saratoga area on January 19 (Irish Hill/Dutchess Views and Questroyal Stud), McMahon will host a Stallion Open House from 10 a. m. to 4 p. m., allowing breeders the opportunity to see as many stallions as possible that day. For more information please contact Joe or John McMahon (518) 587-3426. The farm is located at 58 Dunn Rd. in Stillwater. Copyright ©2019 New York Thoroughbred Breeders, Inc. News unless otherwise noted.